Two views of one of Glo’s RNA-binding domains highlight the amino acids required for binding G-tract RNA (left) and U-A stem structures (right). Courtesy of Cell Reports. Researchers from Princeton University and the National Institute of Environmental Health Sciences have discovered how a fruit fly protein binds and regulates two different types of RNA target sequence. The study, published April 4 in the journal Cell Reports, may help explain how various RNA-binding proteins, many of which are implicated in cancer and neurodegenerative disease, perform so many different functions in the cell. There are hundreds of RNA-binding proteins in the human genome that together regulate the processing, turnover and localization of the many thousands of RNA molecules expressed in cells. These proteins also control the translation of RNA into proteins. RNA-binding proteins are crucial for maintaining normal cellular function, and defects in this family of proteins can lead to disease. For example, RNA-binding proteins are overexpressed in many human cancers, and mutations in some of these proteins have been linked to neurological and neurodegenerative disorders such as amyotrophic lateral sclerosis. “Understanding the fundamental properties of this class of proteins is very relevant,” said Elizabeth Gavis, the Damon B. Pfeiffer Professor in the Life Sciences and a professor of molecular biology. Gavis and colleagues are particularly interested in a protein called Glorund (Glo), a type of RNA-binding protein that performs several functions in fruit fly development. This protein was originally identified due to its ability to repress the translation of an RNA molecule called nanos to protein in fly eggs. By binding to a stem structure formed by uracil and adenine nucleotides in the nanos RNA, Glo prevents the production of Nanos protein at the front of the embryo, a step that enables the fly’s head to form properly. Like many other RNA-binding proteins, however, Glo is multifunctional. It regulates several other steps in fly development, apparently by binding to RNAs other than nanos. The mammalian counterparts of Glo, known as heterogeneous nuclear ribonucleoprotein (hnRNP) F/H proteins, bind to RNAs containing stretches of guanine nucleotides known as G-tracts, and, rather than repressing translation, mammalian hnRNP F/H proteins regulate processes such as RNA splicing, in which RNAs are rearranged to produce alternative versions of the proteins they encode. To understand how Glo might bind to diverse RNAs and regulate them in different ways, Gavis and graduate student Joel Tamayo collaborated with Traci Tanaka Hall and Takamasa Teramoto from the National Institute of Environmental Health Sciences to generate X-ray crystallographic structures of Glo’s three RNA-binding domains. 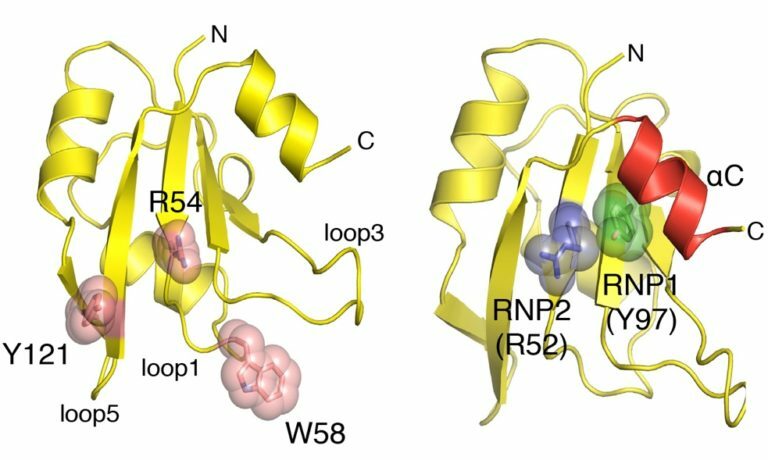 As expected, the three domains were almost identical to the corresponding domains of mammalian hnRNP F/H proteins. They retained, for example, the amino acid residues that bind to G-tract RNA, and the researchers confirmed that, like their mammalian counterparts, each RNA-binding domain of Glo can bind to this type of RNA sequence. However, the researchers also saw something new. “When we looked at the structures, we realized that there were also some basic amino acids that projected from a different part of the RNA-binding domains that could be involved in contacting RNA,” Gavis explained. The researchers found that these basic amino acids mediate binding to uracil-adenine (U-A) stem structures like the one found in nanos RNA. Each of Glo’s RNA-binding domains therefore contains two distinct binding surfaces that interact with different types of RNA target sequence. “While there have been examples previously of RNA-binding proteins that carry more than one binding domain, each with a different specificity, this represents the first example of a single domain harboring two different specificities,” said Howard Lipshitz, a professor of molecular genetics at the University of Toronto who was not involved in the study. To investigate which of Glo’s two RNA-binding modes was required for its different functions in flies, Gavis and colleagues generated insects carrying mutant versions of the RNA-binding protein. Glo’s ability to repress nanos translation during egg development required both of the protein’s RNA-binding modes. The researchers discovered that, as well as binding the U-A stem in the nanos RNA, Glo also recognized a nearby G-tract sequence. But Glo’s ability to regulate other RNAs at different developmental stages only depended on the protein’s capacity to bind G-tracts. The research was supported in part by a National Science Foundation Graduate Research Fellowship (DGE 1148900), a Japan Society for the Promotion of Science fellowship, the National Institutes of Health (R01 GM061107) and the Intramural Research Program of the National Institute of Environmental Health Sciences. The Advanced Photon Source used for this study is supported by the US Department of Energy, Office of Science, Office of Basic Energy Sciences, under contract W-31-109-Eng-38.